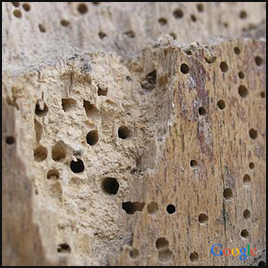 Indications of woodworm usually appears as holes in wooden items such as window frames, door frames or even furniture, with live infections revealing consumed wood powder in the vicinity of the holes. Typically, buildings with known woodworm problems also have problems of excessive dampness. It may be due to inadequate ventilation in roof spaces, basements or such other confined spaces. Though dampness is the major factor that causes the manifestation of most types of woodworms, some species are seen where there is an occurrence of fungal rot. The infestation of woodworms is commonly restricted by the application of chemical insecticides. Conversely, it is also recommended to examine and sort out probable damp problems, as dry wood is rarely affected by woodworms. Moreover, wooden items that remain damp could be infected later on. We survey the entire structure to identify the extent of the woodworm induced damage and the type of woodworm. Our experts then decide on the right insecticide formula and how and where to apply it. Additionally, there are special treatments such as freezing treatments. These are highly effective, but are quite costly and take about three weeks or so to complete. Such treatments may also cause some amount of damage to the building. Low-oxygen treatment is also and effective solution, but again, it is often expensive and very time consuming too. For effectively addressing all woodworm related problems, contact us today.